Intro from Jay Allison: Here’s another in our new series on using music in radio stories. Transom’s friends, The Kitchen Sisters (Davia Nelson and Nikki Silva), tell you how they select and blend music into their signature rhythmic pieces. Special Bonus: Audio engineer Jim McKee gives up his EQ notching and ducking secrets. If you have any idea what this means, you’re going to like this tip. As ever, the essay is illustrated with audio examples and you can talk it over with Nikki and Davia. “An Unexpected Kitchen” was one of the first stories in the Hidden Kitchens series on Morning Edition. As we began to score it (which happens at almost the same moment we get the idea for a story, start to cast it and do the interviews), we decided to give ourselves some rules for creating the score. We don’t usually work that way, but here we were, starting a new series and it seemed time for new rules and a challenge. Because George Foreman grew up in the Fifth Ward in Houston, Texas, we decided all the music in the story would emanate from there. We listened to everything we could get our hands on. But after hours of hearing some great, and not-so-great music, we couldn’t find one piece that really worked with the story we were telling. We’re usually looking for instrumentals. Or something with a long musical intro, an instrumental solo in the middle, and a long tail of instrumental music at the end — no lyrics. We graft beginnings, middles and ends (the instrumental bits) together to use as beds for our stories to lie on. We like it when the music pops at the top and changes rhythms and builds, moving the story forward — a strong drum beat, a deep guitar chord, a startling saxophone — like Moondog’s Symphonique and Bird’s Lament, or Thelonius Monk’s Misterioso, or a cut from Kronos Quartet’s Nuevo… We’re looking for something that moves the story somewhere new and sets a mood and a tone. When the Fifth Ward concept didn’t quite pan out, we decided to expand the search to “music recorded in Houston.” We sifted through dozens and dozens of songs — still couldn’t find it. There was great music, but not music that would tuck into this piece. All right, how about “music from Texas?” That’s when we found Robert Shaw, “The Ma Grinder,” on Arhoolie Records. We loved the driving piano, but suddenly came upon these lyrics: “My name is Piggly Wiggly, I’ve Got Groceries on my Shelf…” Mostly we tend to steer away from lyrics in our stories because they can get too literal if you don’t watch out. But these were so great. And his style of piano playing lay in perfectly under George’s story. Robert Shaw played Texas piano in the “Santa Fe” style, named after the Santa Fe Railroad that ran through the state and the barrelhouse bars along its route. Piano players there favored music that mirrored the rhythm of the train. Shaw was one of the best. When he retired he moved outside of Austin and opened an icehouse, and sold barbeque. He felt like a hidden kitchen in his own right and his music was mixed into the story. Okay, the Texas music angle was working. But suddenly, when we were working on the part of the piece where George Foreman says, “I learned how to disguise my not having any food…” and Jeffrey Newton, a homeless man from Chicago, starts talking about “trailblazing” (“When you’re homeless, you’ve got to blaze a trail to find food…”), Booker T and the MG’s “Hang ‘Em High” jumped in our heads and suddenly Booker T jumped into the mix, and fit. Booker T is Memphis music, not Texas music. Oh well, you’ve got to make rules and break rules. When we’re working with music, we’re often looking for something that isn’t too dense, maybe even spare, but has a strong rhythm and pulse, unless we’re trying to make an emphatic point. We don’t want to drown out the storyteller, or create something so busy that the music competes with the story. Sometimes we use EQ or add a bit of reverb to find a way that the voice notches into the music just so, so they’re working together and are not in competition. With human speech, much of the acoustical information comes to us in vowels and consonants. Vowels tend to fall in the 120 – 140 Hz range, but how we distinguish different vowels at various pitches, falls around 2,760 Hz, or 2.76 kHz. Consonants reside around 5,630 Hz, or 5.6 kHz. I use EQ to help clarify the vowels and consonants, a decibel or two, plus or minus, goes a long way at these frequencies. Typically, I put a corresponding set of notch EQ filters with these same frequencies on the music and duck them down 2 to 6 decibels (depending on the voice and content of the music). What that allows you to do is to have the music remain more present; rather than pulling the entire music track down 2 – 6 decibels, you just pull back the frequencies that are making it difficult to hear what is being said. Got it? There you go. Your pieces are never going to sound the same now that you’ve got this arrow in your quiver. Put some arrows in Transom's quiver. We often cut music to fit our tracks. And loop sections of it too. We sometimes add a little pause, or take a bit away to have the voice nestle onto an instrument or a beat. Sometimes we spread out a story so it really flies with the music. We’ll often graft the end of a piece of music to another section to create more drama, or give a story, or the whole piece, an end. We often use the same piece of music at the open and close of a piece, as a sort of bookend or frame, a repeating theme. Once we choose a piece of music we edit the voice track so it aligns with the rise and fall and rhythm of the music. The music is the driver of the scene, and the story becomes the lyrics of the song. When we interview people we always ask them to tell us about their own “soundtrack,” the music that captured the time and place they are telling us about. These songs probably make it into about 20% of the stories we do. A lot of times the literal music of a story doesn’t work as well as something on a more intuitive level, but when it does, it’s something we love. We also ask people to sing for us. We’ll try to score mixing the sound of the person we’re interviewing, singing, cross fading with the recording from the era. When it works it’s cool. But it doesn’t always work. Music, it can’t be too thick or busy or textured. It can’t compete or it swallows up and drowns out a voice. You don’t want it too low or too high under the story. We experiment with the levels every time. Sometimes we like to have the person disappear into the music — their voice fades slowly as the music is rising slowly and they are swallowed and gone. We use music, but we also use sound to score our stories. The beeps from listener phone messages that we use to launch many stories are some of our favorite sonic elements to work with, and we drop them like pixie dust into the mix whenever we can. You can find more features about Using Music here. The Kitchen Sisters (Davia Nelson & Nikki Silva) are the producers of the duPont-Columbia Award-winning NPR series, Hidden Kitchens and two Peabody Award-winning NPR series, Lost & Found Sound and The Sonic Memorial Project. Their most recent NPR series, The Hidden World of Girls aired on All Things Considered and Morning Edition. The Hidden World of Girls specials are hosted by award-winning writer and actress, Tina Fey. Their new radio and multimedia series, The Making Of…, a collaboration with KQED and AIR, looks at what people make in the Bay Area and why. The series is part of new public radio experiment, 10 independent producers collaboration with 10 stations throughout the country to create the new public radio programming of the future. The Kitchen Sisters are the producers of hundreds of stories for NPR and public broadcast about the lives, histories, art and rituals of people from all walks of life who have shaped our diverse cultural heritage. 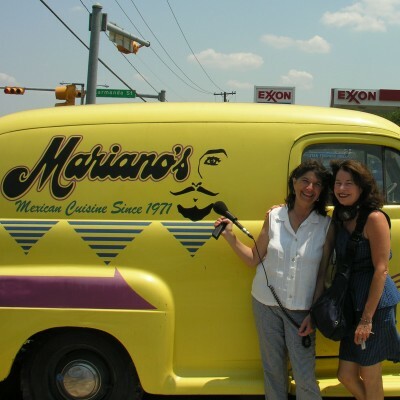 Their nationwide radio specials have been hosted by Frances MacDormand, Francis Coppola, Paul Auster and Willie Nelson, who narrated Hidden Kitchen Texas which was nominated for a James Beard Award and the inspiration for their book, Hidden Kitchens Texas: Stories, Recipes and More from the Lone Star State. Other noted Kitchen Sisters stories include: Waiting for Joe DiMaggio, Route 66: The Mother Road, The Nights of Edith Piaf, Carmen Miranda: The Life and Times of the Brazilian Bombshell, WHER: 1000 Beautiful Watts, Guillermo Cabrera Infante: Memories of an Invented City, Tupperware, The Road Ranger, and War and Separation. The Kitchen Sisters are also involved in educating and training new voices for public media in an imaginative, artistic approach to storytelling. They have taught at UC Berkeley Graduate School of Journalism, the University of California Santa Cruz Social Documentary Graduate Program and frequently lecture and provide training at universities, festivals, workshops, radio stations, public forums and events throughout the country and abroad. They also train and work with interns, college students, and youth radio apprentices and participate in the life of the public radio community throughout the country. In addition to producing radio, Davia Nelson is a screenwriter and casting director. She lives in San Francisco. Nikki Silva is also a museum curator and exhibit consultant. She lives with her family on a commune in Santa Cruz, California. Great stuff Sisters! Thank you and to Transom. I have only produced a few short audio narratives but working on a few more. I am transitioning from a career spent in the classroom to one writing stories and sharing my photography on traveltheworldover.org. I hope to complete a future Transom workshop. I tell you I have a much deeper appreciation for George Forman after listening to your story! We did too. George caught us by surprise. And his voice sure works well with music. We’ll look forward to seing your photography as it emerges. I was surprised and sad to learn of George’s childhood experiences with hunger and poverty, but also impressed how he turned that anger into something ultimately positive. Thank you for checking out my photos and stories. See you on the radio! Thanks for the eq tip, superb! KUSP! Our mothership. The station where The Kitchen Sisters cut our teeth, and first starting using music in stories. Very nice piece and great tips on the use of music. When wouldn’t you use music? Hi Nancy! What a great question. We don’t want to go wall to wall music in a story. A story heard in the clear, with nothing underneath it, just the true naked sound is a powerful and important and stands out in contrast to stories that have music that they ar riding on. Especially when the interview has a strong sense of place –be t bids or kids ayg inthbagrground or sprinklers… Experiment. Try it with and without. There are no hard and fans rules. “What is EQ and where do I find it,” he asked confusedly. I really need a workshop! Check out immigrant stories.net when you get a chance. Thanks for the wonderful radio, you two too inspired the Immigrant Stories Project. Stimulated me to start playing. 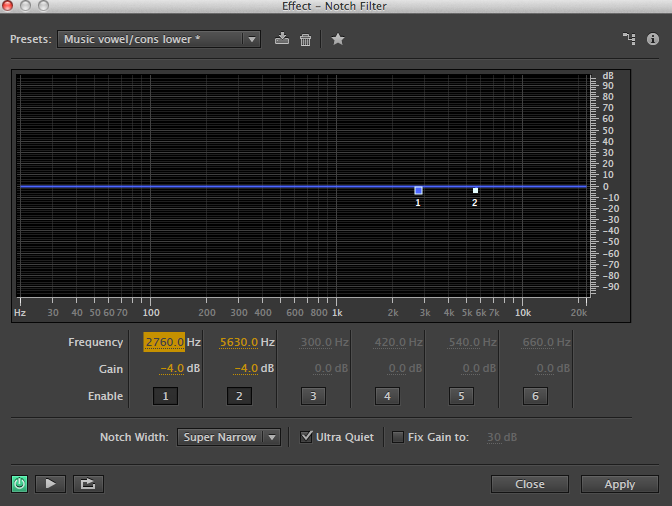 I also need a video demonstration of the EQ. I immediately went to Adobe Audition to see if I could do this technique. Drat! Foiled again. I found “Filter and EQ” and started messing round but couldn’t come up with the technique. Most helpful, Steve. Thanks for expanding on this. Hi Nancy, let me see if we can get Jim McKee involved here. We come up with these ideas but it is wizard Jim who knows how to lay down the sonic law when it comes to filtering and eq. He does it so intuitively. Let’s see if he has time to create something visual that helps clariynhisntehnique. Back soon with more info. I was wondering if you ended up making a tutorial on the filtering and EQ — I haven’t been able to figure out how to do it. I find your work very inspiring! This post helped me with a current project that uses industrial sounds as a kind of symphony to describe the loss of jobs in a town. Also, the I found the George Foreman story a very unique way to talk about homelessness, community and FOOD. Thanks to both of you and to transom.org. Just passed this along to my students–they are totally getting into radio stories now! Let us know what your students said. We’re in the midst of producing a new season of Hidden Kitchens stories for Morning Edition. We’re looking for great Italian instrumental music, especially Sicilian music, and also Russian music for our story about Dissident Kitchens. Anyone have any music to suggest? Check out Gino D’Auri. He’s the grandson of an Italian Gypsy, plays guitar, and although Sicilian music is characterized by mandolin and guitar as a backup, this man’s playing stands on it’s own. It’s just different enough to appeal. The album is Flamenco Mystico, and the cut I like for it’s not-to-bright brightness is “Guajira Antigua” – means ‘old time country music’. Looking forward to the new series! Kelly. Great lead. Thank you. Gino D’Auri is new to us. Like the sound of his lineage. We’ll let you know what happens. It’s one of the things we like best about producing stories, discovering new music and experimenting with different sounds, rhythms and textures to build a scene and add further dimension and tension to the piece. We’ve got some great Palermo hip hop, some Sicilian sheherd’s Jews harp, singer Matilde Polliti, the gypsy singer Modugno….and a tour of the Museum of the Anti-Mafia. Anyone else have some thoughts on Italian, Old English or Russian music. We’re in heavy scoring mode. This post is so helpful! Can’t wait to try the “secret EQ sauce”. Thanks all! Hi Ally, Give it a try and let us know how it goes. We’re about to mix a new piece with Jim tomorrow, the one about anti-Mafia wine, and I know we’ll be relying on that technique for the layering of sound and story. Just want to say how much I have enjoyed reading through this – in the middle of editing a long form piece on a singer/storyteller, so very much grappling with these issues at the moment. Particularly appreciated the technical tips about EQ. Many thanks, Transom, Davia, Nikki & Jim. Hey Everybody! Be sure and read the piece Andrew Kurjata wrote and forwarded to us and Transom. It’s full of such insight and challenge. We just mixed the Mafia Wine story, which at the moment we’re calling “The Pizza Connection.” I notice we were more sparse than usual with the music. I wonder if writing this article had anything to do with it.